PeiPei.HaoHao - Singapore Parenting, Lifestyle, Travel Blog: MONOPOLY HERE & NOW - Vote for Singapore! MONOPOLY HERE & NOW - Vote for Singapore! My goal is to build my hotel at Mayfair. Oh, I'm talking about playing the MONOPOLY game - one of my favourite board games. It is a great family bonding activity. We are thrilled to receive MONOPOLY 80th ANNIVERSARY Edition from Hasbro Singapore. What? MONOPOLY is 80 years old! I simply love the vintage inspired game board, cards, and tokens which are iconic to each MONOPOLY decade! To learn more about the MONOPOLY brand, check out hasbro.com/monopoly/en_SG! In celebration of the MONOPOLY brand’s 80th anniversary, Hasbro, Inc. has teamed up with social news and entertainment company BuzzFeed to ask fans to choose which great cities around the world will be featured as property spaces in the new MONOPOLY HERE & NOW: World Edition game launching this fall. From 4 to 10 March 2015, all cities big and small will have the chance to compete for two spaces on the MONOPOLY HERE & NOW game boards during “Wild Card Week.” You can “write-in” additional locations not included in the initial list of destinations, and the cities with the most submissions during this week will be featured as the two brown property spaces in the new game. Since we are celebrating SG50 this year, why not vote for Singapore to be featured as a property space in the new MONOPOLY HERE & NOW: World Edition? Hasbro Singapore kindly offers to sponsor one set of MONOPOLY 80th ANNIVERSARY Edition (Worth S$49.90) to one lucky PeiPei.HaoHao reader! Vote for Singapore at VoteMonopoly.com, Share on your Facebook timeline after voting and Tag @Peipei.haohao. This giveaway will be closed on 3 March 2015, 2359 hrs. The winners will be randomly drawn, and will be announced on 9 March 2015. The winner will collect the prize from Strategic Public Relations Group office located at 61 Robinson Road #09-04. Update: Congratulations to Rowena Lim! 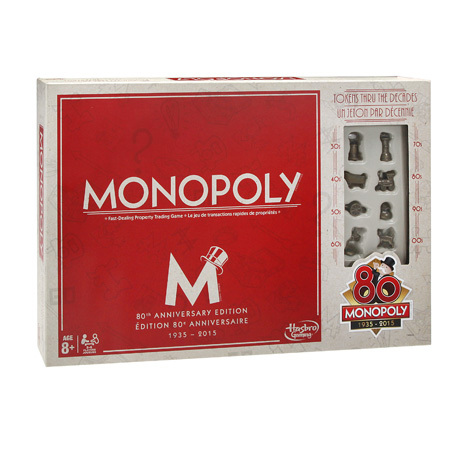 Disclaimer: We received a set of MONOPOLY 80th ANNIVERSARY Edition. No monetary compensation was received. The giveaway is sponsored by Hasbro Singapore. All opinions and photos (unless stated otherwise) are mine. The giveaway is in no way sponsored, endorsed or administrated by, or associated with Facebook.